Designated as terrorist organization by Australia, Canada, the European Union, Japan, New Zealand, the United Kingdom and the United States. The Islamic Jihad Movement in Palestine (Arabic: حركة الجهاد الإسلامي في فلسطين‎, Harakat al-Jihād al-Islāmi fi Filastīn) known in the West as simply Palestinian Islamic Jihad (PIJ), is a Palestinian Islamist terrorist organization formed in 1981 whose objective is the destruction of the State of Israel and the establishment of a sovereign, Islamic Palestinian state. PIJ has been labelled a terrorist organisation by the United States, the European Union, the United Kingdom, Japan, Canada, Australia, New Zealand and Israel. Iran is a major financial supporter of the PIJ. Following the Israeli and Egyptian squeeze on Hamas in early 2014, PIJ has seen its power steadily increase with the backing of funds from Iran. Its financial backing is believed to also come from Syria. The Islamic Jihad Movement has sent "its gratitude to the brothers in Hezbollah, the Islamic resistance in South Lebanon. Particularly Hassan Nasrallah, for their stance and support, be it financial, military or moral support". The armed wing of PIJ is Al-Quds Brigades, formed in 1981, which is active in the West Bank and Gaza Strip, with its main strongholds in the West Bank being the cities of Hebron and Jenin. Its operations have included suicide bombings, attacks on Israeli civilians, as well as the firing of rockets into Israel. PIJ has much in common with Hamas, with both fighting against the existence of the State of Israel. Both groups were formed as offshoots of the Muslim Brotherhood and receive a large amount of funding from Iran. With similar goals, Hamas and PIJ have worked together on a number of projects. Flag of the Islamic Jihad Movement in Palestine. The organization's banner leads from a verse in the Qur'an "And those who do jihad for Us, we shall guide them to our paths. And God is with those who do good." Ramadan Abdullah Mohammad Shallah is wanted by the FBI for conspiracy to conduct the affairs of the designated international terrorist organization known as the "Palestinian Islamic Jihad". PIJ was formally established in Gaza in 1981 by two Palestinian activists: Dr Fathi abd al-Aziz Shaqaqi, a Rafah-based physician, and Shaykh Abd al-Aziz Awda, an Islamic preacher from the Jabaliyya refugee camp, as well as Ramadan Shalah, Bashir Moussa and three other Palestinian radicals. Based in Egypt, Shaqaqi and Awda were originally members of the Muslim Brotherhood. Their views on the destruction of Israel, however, led them in 1979 to establish Islamic Jihad-Shaqaqi Faction, a branch of the Egyptian Islamic Jihad. and conducted operations out of Egypt. The Shaqaqi Faction was expelled from Egypt in 1981 following the assassination of Egypt’s President Anwar Sadat by the Egyptian Islamic Jihad. Shaqaqi and Awda returned to Gaza where they formally established PIJ, from where it continued its operations. The aim of the organization was the establishment of a sovereign, Islamic Palestinian state within the geographic borders of pre-1948 Mandatory Palestine. Completely rejecting the political process, the organization professes that its goals can only be achieved through military means. PIJ began its armed operations against Israel in 1984. In 1988, its leaders were exiled by Israel to Lebanon. While in Lebanon, the group received training, support and other backing from Hezbollah and its backers in Iran, and developed a close relationship with the organization. In 1990, the headquarters of PIJ moved to the Syrian capital, Damascus, where it continues to be based, with offices in Beirut, Tehran, and Khartoum. PIJ masterminded several suicide bombings in Israel, the first one being the Tel Aviv–Jerusalem bus 405 suicide attack in 1989 which resulted in 16 civilian deaths. (See List of Palestinian suicide attacks.) Shaqaqi was a key player in setting up the Alliance of Palestinian Forces in January 1994, a coalition of eight PLO groups, Islamic Jihad and Hamas, rejecting the Oslo process. PIJ was and continues to be considered by Israel the most extreme organization in its operational methods and commitment to the destruction of Israel. By 1995 PIJ was, according to Fisk, "perhaps the fiercest of all Israel's modern-day enemies." Shaqaqi was assassinated in 1995 in Malta, and Ramadan Shalah became secretary-general of the organisation. There was a subsequent crackdown on the PIJ by Israel and the Palestinian National Authority which led to a significant weakening of the organization. On 20 February 2003, University of South Florida computer engineering professor Sami Al-Arian was arrested after being indicted on a terrorism-related charge. U.S. Attorney General John Ashcroft alleged at a press conference that Al-Arian was the North American head of the Palestinian Islamic Jihad. On 6 December 2006, Sami Al-Arian was sentenced to 57 months in prison, pursuant to a plea bargain. In November 2006 he was found guilty of civil contempt for refusing to testify before a federal grand jury and served 21 months in prison on that conviction. On 27 June 2014, the US Federal Government dropped all charges against Al-Arian. PIJ is alleged to have used minors. On 29 March 2004, 15-year-old Tamer Khuweir of Rifidia, a suburb of Palestinian city Nablus in the West Bank, was captured by Israeli forces as he planned to carry out a suicide mission. His older brother claimed he was brainwashed and demanded the Palestinian Authority investigate the incident and arrest those responsible for it. Following further terrorist attacks on civilians in Israel, Shalah and Awda were indicted under United States law and added in 2006 to the United States FBI Most Wanted Terrorists list. In February 2012, the Hamas government in the Gaza Strip distanced itself from PIJ. During the March 2012 Gaza–Israel clashes, which followed the Israeli assassination of Popular Resistance Committees leader, Zuhir al-Qaisi, who bragged of kidnapping Gilad Shalit, PIJ and PRC opened attacks on Israel. Hamas refrained from joining PIJ and PRC in attacking Israel. Over a hundred Palestinians were killed or injured in the ensuing violence, but Israel did not attack any Hamas targets at the time. The eventual ceasefire was negotiated between Israel and the militant groups, not Hamas. London-based Arabic newspaper Asharq al-Awsat reported in May 2015 that Iran had stopped funding PIJ due to the group's neutrality over the Saudi Arabian-led intervention in Yemen, throwing PIJ into a severe financial crisis. Iran had expected PIJ to condemn the intervention led by Saudi Arabia, Iran's chief regional rival. Palestinian newspaper al-Quds reported that Iran is now supporting an offshoot of PIJ called as-Sabirin (Arabic for "the patient ones"), headed by Islamic Jihad veteran Hisham Salem. Ramadan Shalah was interviewed by a delegation from the World Federation of Scientists in Damascus, Syria, 15 December 2009. In this interview he argues, that the Israelis will accept neither a two state nor a one state solution and that the only choice is to continue the armed struggle until Israel's defeat. We have lived together in peace for centuries. And if Netanyahu were to ask if we can live together in one state, I would say to him: "If we have exactly the same rights as Jews to come to all of Palestine. If Khaled Meshaal and Ramadan Shalah can come whenever they want, and visit Haifa, and buy a home in Herzliyah if they want, then we can have a new language, and dialogue is possible." The Palestinian Islamic Jihad has claimed responsibility for many militant activities over the years. The organization is responsible for a number of attacks including more than 30 suicide bombings; indeed, on 22 December 2001, PIJ vowed to continue its campaign despite Hamas' decision to halt suicide bombings inside Israel in response to an alleged crackdown by Yasser Arafat. PIJ's representative in Lebanon, Abu Imad Al-Rifai noted, "Our position is to continue. We have no other choice. We are not willing to compromise." The international community considers the use of indiscriminate attacks on civilian populations and the use of human shields as illegal under international law. August 1987: The PIJ claimed responsibility for a shooting that killed the commander of the Israeli military police in the Gaza Strip. July 1989: Attack of Egged bus 405 along the Jerusalem–Tel Aviv highway, at least 14 people killed (including two Canadians and one American) and dozens more wounded. Though intended to be a suicide attack, the perpetrator survived. 4 February 1990: A bus carrying Israeli tourists in Egypt was attacked. The attack left 11 people, including 9 Israelis dead and 17 others injured. December 1993: Killed an Israeli reservist, David Mashrati, during a public bus shooting. April 1994: A car bomb aboard a public bus killed 9 people and injured 50. January 1995: Bomb attack near Netanya killing eighteen soldiers and one civilian. April 1995: Bomb Attack in Netzarim and Kfar Darom. The first bomb killed 8 people including American student, Alisa Flatow, and injured over 30 on an Israel bus; the second attack was a car bomb that injured 12 people. March 1996: A Tel Aviv shopping mall is the site of another bombing killing 20 and injuring 75. November 2000: A car bomb in Jerusalem at an outdoor market killed 2 people and injured 10. March 2002: A bomb killed seven people and injured approximately thirty aboard a bus travelling from Tel Aviv to Nazareth. June 2002: Eighteen people are killed and fifty injured in an attack at the Megiddo Junction. July 2002: A double attack in Tel Aviv killed five people and injured 40. November 2002: 12 soldiers and security personnel killed in an ambush in Hebron. May 2003: Three people killed and eighty-three injured in a suicide bombing at a shopping mall in Afula. August 2003: A bomber killed 21 people and injured more than 100 people on a bus in Jerusalem. October 2003: A bomb killed 22 and injured 60 at a Haifa restaurant. October 2005: A bomb detonated in a Hadera market was responsible for killing seven people and injuring 55, five of them severely. April 2006: A bomb in a Tel Aviv eatery killed eleven and injured 70. January 2007: Both the al-Aqsa Martyrs' Brigades and the PIJ claim responsibility for a suicide bombing at an Eilat bakery that killed three. Armored vehicles marked with TV are an invaluable protection for genuine journalists working in hostile environments. The FPA has long campaigned for the continued availability of armored vehicles for its members, despite official opposition in some quarters. The abuse of this recognized protection for the working journalist is a grave development and we condemn those that carried it out. Such an incident will reduce the protection offered by marked vehicles. During a press conference, an Islamic Jihad spokesperson Abu Ahmed denied that they had put press markings on the jeep used in the attack and said, "The Al-Quds Brigades used an armoured jeep resembling military armoured jeeps used by the Zionist intelligence services." On 26 March 2009, two Islamic Jihad members were imprisoned for a conspiracy "to murder Israeli pilots and scientists using booby-trapped toy cars". On 15 November 2012, Islamic Jihad fired two Fajr-5s at Tel Aviv from Gaza, one landing in an uninhabited area of the suburbs and the other in the sea. On 24 June 2013, six rockets were fired into Israel; major news outlets reported that the Islamic Jihad were behind the attacks. Islamic Jihad has also deployed its own rocket, similar to the Qassam rocket used by Hamas, called the al-Quds rocket. Islamic Jihad also control dozens of religious organizations in the Palestinian territories that are registered as NGOs and operate mosques, schools, and medical facilities that offer free services. Like other Islamic associations, these are heavily scrutinized by the Palestinian National Authority who have shut some of them down. In one Islamic Jihad kindergarten graduation, children dressed up in military uniforms, waved guns, shouted anti-Israel slogans, and spoke of blowing themselves up to kill "Zionists". Islamic Jihad also operates dozens of summer camps for children. They have opened up 51 summer camps which attracted approximately 10,000 children in 2010. We teach the children the truth. How the Jews persecuted the prophets and tortured them. We stress that the Jews killed and slaughtered Arabs and Palestinians every chance they got. Most important, the children understand that the conflict with the Jews is not over land, but rather over religion. As long as Jews remain here, between the [Jordan] river and the sea, they will be our enemy and we will continue to pursue and kill them. When they leave we won't hurt them. Mahmoud al-Majzoub: member of the Shura Council, killed by car bomb, 26 May 2006. Husam Jaradat: senior commander in Jenin, cousin of Hanadi Jaradat. Assassinated in the Jenin refugee quarters on 30 August 2006. Ayman al-Fayed: senior commander of Gaza Strip, assassinated in a blast in the Bureij refugee camp on 16 February 2008. Ziad Abu-Tir: senior member of the military wing was killed in an Israeli airstrike in the Khan Younis area on 29 December 2008. Khaled Shalan: Senior commander killed by an Israeli missile strike on his car in Gaza 4 March 2009. ^ Ben Gedalyahu, Ben (7 November 2011). "Iran Backs Islamic Jihad's 8,000-Man Army in Gaza". Israel National News. Arutz Sheva. Retrieved 7 November 2011. ^ "List of organisations recognized as terrorist groups" (PDF). europa.eu. Retrieved 16 March 2018. ^ "MoFA Japan" (PDF). mofa.go.jp. Retrieved 16 March 2018. ^ "Palestinian Islamic Jihad". Australian National Security. Retrieved 17 December 2014. ^ Mannes, Aaron (2004). Profiles in Terror: The Guide to Middle East Terrorist Organizations. Rowman & Littlefield. p. 201. ^ "THE TERRORIST CONNECTION - IRAN, THE ISLAMIC JIHAD AND HAMAS". fas.org. Retrieved 16 March 2018. ^ Palestine Islamic Jihad (PIJ) Archived 16 October 2014 at the Wayback Machine. NCTC. ^ "Australian Government Attorneys General's Department - Palestinian Islamic Jihad". 20 August 2006. Archived from the original on 20 August 2006. Retrieved 16 March 2018. ^ The Gaza Strip: Who's in charge? ^ Sunni Palestinian Islamic Jihad Thanks Iran and Hezbollah (English Subtitles). YouTube. 13 July 2014. Retrieved 17 July 2015. ^ Quintan Wiktorowicz (2004). Islamic Activism: A Social Movement Theory Approach. Indiana University Press. p. 122. ISBN 978-0-253-21621-2. Retrieved 14 December 2012. ^ Marlowe, Lara (6 February 1995). "Interview with a Fanatic". Time. Retrieved 4 February 2015. ^ Fletcher, Holly (10 April 2008). "Palestinian Islamic Jihad". Council on Foreign Relations. Retrieved 4 February 2015. ^ a b c d "Palestinian Islamic Jihad". Archived from the original on 22 January 2009. Retrieved 7 March 2009. ^ "Fathi Shiqaqi". Jewish Virtual Library. Retrieved 29 August 2013. ^ Reich, Bernard; Goldberg, David H. (2008). Historical Dictionary of Israel. Scarecrow Press. pp. 373–375. ISBN 0-3133-2485-9. Retrieved 10 March 2011. ^ Fisk, Robert (30 January 1995). "The doctor who finds death a laughing matter". The Independent. Retrieved 4 February 2015. ^ Shay, Shaul. The Axis Of Evil: Iran, Hizballah, And The Palestinian Terror. Transaction Publishers. pp. 76–77. ISBN 141281779X. Retrieved 10 March 2011. ^ St. Petersberg Times, 23 April 2006. ^ ""Details and Statements On Federal Court Dismissing All Charges Against Sami Al-Arian," Jadaliyya, 27 June 2014". Archived from the original on 14 July 2014. Retrieved 30 June 2014. ^ "Brother slams Palestinian militants for luring teenager into suicide mission". Yahoo News. AFP. 30 March 2004. Retrieved 5 September 2014. ^ "FBI — ABD AL AZIZ AWDA". FBI. Retrieved 17 December 2014. ^ Ilan Ben Zion (14 March 2012). "The eye of the Islamic Jihad storm". The Times of Israel. Retrieved 29 March 2012. ^ Marc Tracy (12 March 2012). "Terrorist Killing Prompts Gaza Rocket Exchange". Tablet Magazine. Retrieved 31 March 2012. ^ Elhanan Miller (26 May 2015). "Iran said to pull Islamic Jihad's funding over group's neutrality on Yemen". Times of Israel. Retrieved 26 May 2015. ^ "Interview with Ramadan Shallah, Secretary General, Palestinian Islamic Jihad (Damascus, Syria, December 15, 2009)" (PDF). Perspectives on Terrorism. IV (2). 23 July 2010. ^ "Palestinian Islamic Jihad". Jewish Virtual Library. Retrieved 7 March 2009. ^ Kurz, Robert W.; Charles K. Bartles (2007). "Chechen suicide bombers" (PDF). Journal of Slavic Military Studies. Routledge. 20: 529–547. doi:10.1080/13518040701703070. Retrieved 30 August 2012. ^ "Hamas Caught Using Human Shields in Gaza". idfblog.com. Israel Defense Forces. Retrieved 10 July 2014. ^ Erlanger, Steven; Akram, Fares. "Israel Warns Gaza Targets by Phone and Leaflet". The New York Times. Retrieved 10 July 2014. ^ "Protection of the civilian population". Protocol Additional to the Geneva Conventions of 12 August 1949, and relating to the Protection of Victims of International Armed Conflicts (Protocol I), 8 June 1977. International Committee of the Red Cross. Retrieved 10 July 2014. ^ "Palestinian accused in bus crash". Rome News-Tribune. AP. 7 July 1989. p. 6-A. Retrieved 18 June 2009. ^ a b c "The Listing of Palestinian Islamic Jihad (PIJ)" (PDF). Parliament of Australia. Archived from the original (PDF) on 24 August 2008. Retrieved 8 March 2009. ^ "Hebron ambush scene dubbed 'Death Alley'". Haaretz. 17 November 2002. ^ "Gaza: Armed Palestinian Groups Commit Grave Crimes". Human Rights Watch. Retrieved 17 July 2015. ^ "Journalists slam use of 'press vehicle' by Gaza militants". Archived from the original on 27 September 2007. Retrieved 17 July 2015. ^ Stoil, Rebecca Anna. "Two Islamic Jihad conspirators jailed. "[permanent dead link] Jerusalem Post. 26 March 2009. Retrieved 27 March 2009. ^ "Rockets hit near Tel Aviv as Gaza death toll rises". Reuters. Retrieved 17 December 2014. ^ "6 Gaza rockets hit south; IDF retaliates". ynet. Retrieved 17 December 2014. ^ "Six rockets fired from Gaza towards Israel's South". The Jerusalem Post. Retrieved 17 December 2014. ^ "Six rockets fired from Gaza explode in southern Israel". The Times of Israel. Retrieved 17 December 2014. ^ Isabel Kershner, "Rocket Fire From Gaza Shakes Cease-Fire With Israel", The New York Times, 25 June 2013. ^ a b Palestinian civil society: foreign donors and the power to promote and exclude. Benoît Challand. p. 67-69. ^ Levy, Elior (12 June 2012). "Gaza kindergartners want to 'blow up Zionists'". Yedioth Ahronot. Retrieved 9 July 2012. ^ "سرايا القدس الاعلام الحربي". Saraya. Retrieved 10 March 2013. ^ "Jihad summer camp: Sand, soccer and the Zionist enemy". Haaretz. 27 August 2006. ^ "Samtal med en terrorist". Stockholms Fria. Retrieved 17 December 2014. Hatina, Meir (2001). Islam and Salvation in Palestine: The Islamic Jihad Movement. Syracuse University Press. ISBN 9652240486. Fletcher, Holly (10 April 2008). "Palestinian Islamic Jihad". Council on Foreign Relations. Retrieved 22 August 2012. 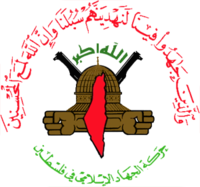 The Izz ad-Din al-Qassam Brigades is the military wing of the Palestinian Hamas organization. Fathi Shaqaqi was the co-founder and Secretary-General of the Islamic Jihad Movement in Palestine. The 2006 Tel Aviv shawarma restaurant bombing was a suicide bombing on April 17, 2006 at "Rosh Ha'ir" shawarma restaurant in Tel Aviv, Israel. Eleven Israeli civilians were killed in the attack and 70 were injured. The Palestinian militant organization Islamic Jihad claimed responsibility for the terror attack. 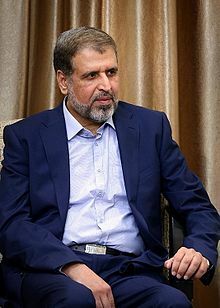 Ramadan Shalah is the leader of Palestinian Islamic Jihad (PIJ). The Stage Club bombing was a terrorist attack which occurred on February 25, 2005 in which a Palestinian suicide bomber blew himself up outside the "Stage" beachfront nightclub in Tel Aviv, Israel, killing 5 people and injuring 50. The 2002 Tel Aviv outdoor mall bombing was a terrorist attack which occurred on 25 January 2002 in which a Palestinian suicide bomber blew himself up in Tel Aviv, Israel, injuring at least 24 civilians. The Palestinian rocket arsenal used in the Arab–Israeli conflict includes a wide range of rockets and missiles, varying in design, size and payload capacity. Palestinian rockets include those locally made in Gaza and the West Bank as well as weapons smuggled from Iran and Syria. Rockets are used in attacks on Israel, mostly to target Israeli civilian centers in addition to Israeli military posts. Various Palestinian groups have used rockets against Israel including Fatah, Hamas, Islamic Jihad, as well as left-wing groups. Rockets are one of the main weapons produced by Palestinian militant and freedom fighter groups. The Sabireen Movement, meaning the "Movement of the Patient Ones", is a Palestinian armed group that is closely aligned with Iran and Hezbollah. The group was formed in early 2014 after some leaders in Palestinian Islamic Jihad (PIJ) converted to Shia Islam and became dissatisfied with PIJ's leadership and their stance, as well as Hamas' stance regarding the Yemeni Civil War and Syrian Civil War, where it supported the Saudi-led intervention and anti-government groups, respectively.